Caja Laboral claimed its first win of the 2012-2013 Turkish Airlines Euroleague with a road victory over EA7 Emporio Armani on Thursday night, downing the previously undefeated Italian side 85-95 in a key game in Group C. It was a closer contest than the scoreline suggests, featuring numerous lead changes and hot streaks by both teams. 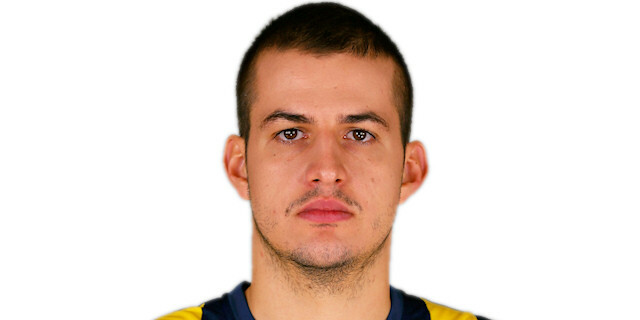 Back after a stomach virus sidelined him in Spanish league action over the the weekend, Nemanja Bjelica led Caja Laboral with 20 points and 9 rebounds and emerged when it mattered in the fourth quarter. 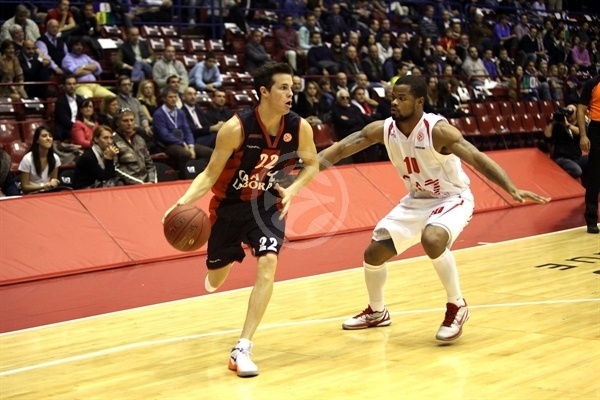 Fernando San Emeterio added 18 points and 6 assists, while Maciej Lampe and Andres Nocioni netted 12 each. 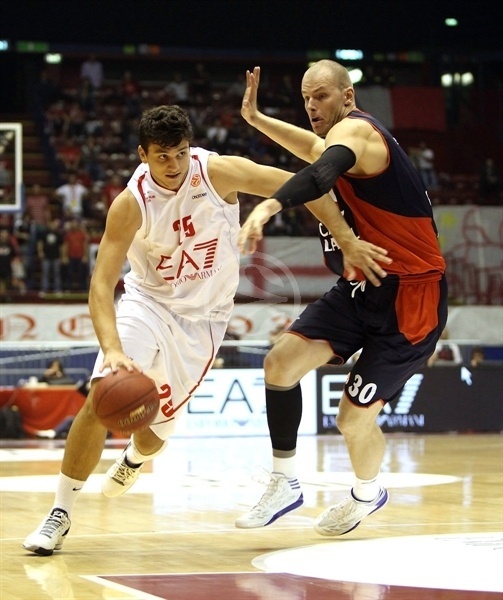 However the win came at a price: Nocioni was stretchered off in the third quarter with a neck injury. 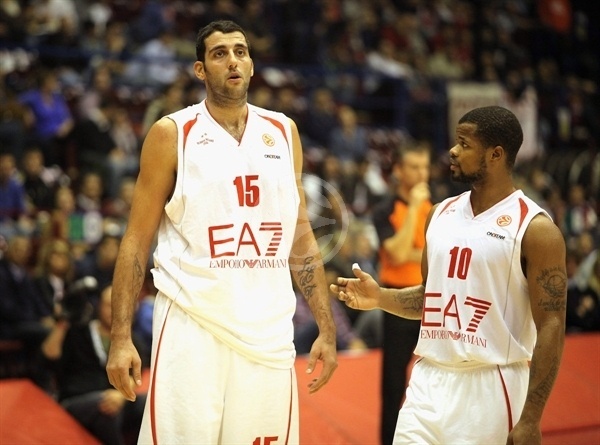 Iaoannis Bourousis led the way for Armani with 22 points and 11 rebounds, but fouled out to leave his team in trouble late on. Malik Hairston scored 19 and Keith Langford 13 in defeat. Caja Laboral won the tip-off, but immediately had cause for concern. 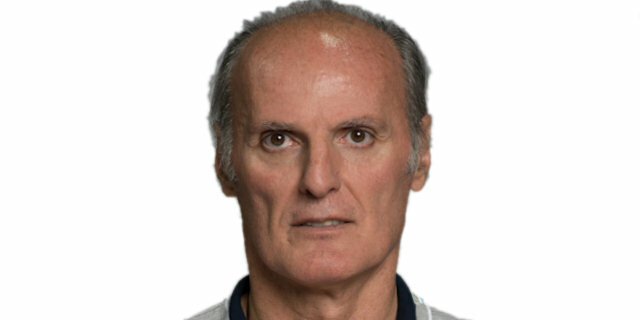 Nocioni slipped in the paint and was forced out of the action, replaced by San Emeterio. Hairston laid up the first points of the game, one minute in, with his shot immediately evened up by Caja Laboral’s Lampe. Armani set the tempo and went about establishing a lead, but Laboral stuck with it and finally went in front, 7-8, before the halfway point in the first quarter. Things were back level after an Omar Cook triple for the home team, then a Lampe layup as the visitor’s response. The game remained at 10-10 for over a minute, until Nemanja Bjelica was fed inside by an astounding pass from San Emeterio. Lampe upped the advantage to 10-15 with his first three-pointer of the night, matched by Armani’s Langford from outside just seconds later. Nocioni was brought back in for Bjelica after shaking off his early over-stretch, and was just in time for a close view of Nicolo Meli’s excellent triple. San Emeterio missed his first free throw of the season (his 10th attempt) and that error was the difference at the end of the first quarter: Armani led 19-18. Armani went 22-18 ahead after Hairston and Melli exchanged passes, finding the former wide open for the three. Three consecutive layups from Bjelica brought Laboral back in a second quarter that was just as tight as the first. A three-point play after going coast-to-coast by Rok Stipcevic moved Armani ahead by 4, bolstered to 6 with Bourousis’s put back. 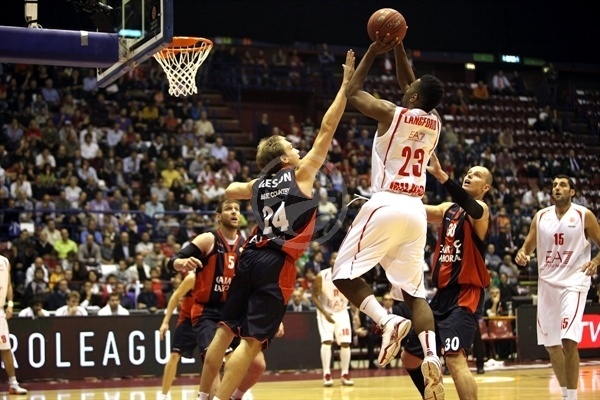 His second offensive rebound brought the score to 32-24, then Langford stretched it to 35-24. 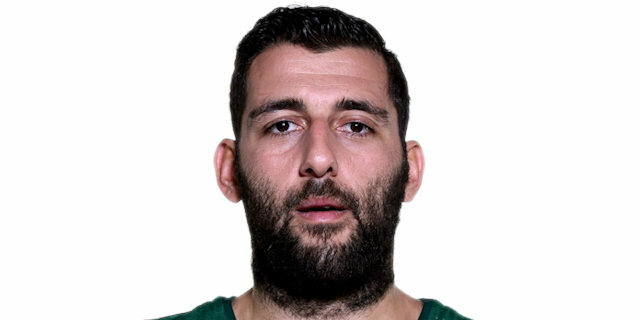 Bourousis found his groove with rebounds, free throws and a post-up inside –the Greek center emerging as the dominant player for Armani. Nocioni’s spin move had Laboral within 4 points as it worked for a comeback, the Argentinian showing no ill-effects of his earlier awkward fall. His sharp free throw shooting, including 2 for an Antonis Fotsis technical foul, then a Bjelica three-pointer, gave a surprising lead for Laboral as it completed a 7-point turnaround to make it 42-43. Coach Sergio Scariolo called a timeout for Armani, Hairston found his way inside with just seconds remaining and got his team back in front. He drew the foul, missed the free throw and the game went into half time at 44-43. Langford, one of the go-to-guys for Armani, opened the second half scoring with a drive down the lane, then Melli saw his layup drop as he got the foul. 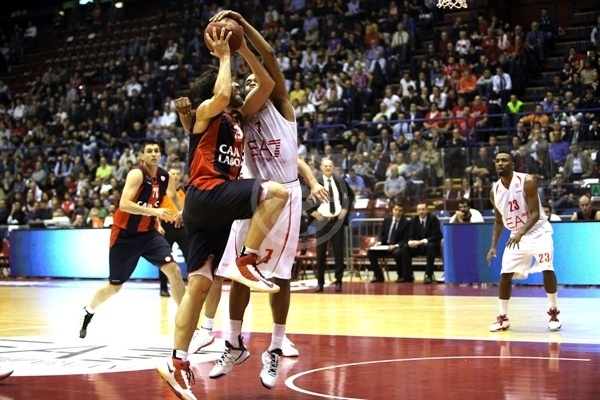 Two Hairston layups demonstrated the speed of the Italian offense, moving Armani further ahead of Laboral –who had Nocioni’s sharpness from the line to thank for keeping the score close. Bourousis picked up three fouls in quick succession , just before an outstanding spin and reverse layup-plus-foul. Armani led 55-50 until Nocioni once again went to ground, this time off Hairston’s third foul of the game. Nocioni was stretchered off after a long delay in play, to be assessed in the dressing room. Brad Oleson sank both of the resulting free throws, on as a replacement, and then put down a three-pointer to level things at 55-55. A bucket inside was his next trick, sandwiching Bourousis’s 18th points of the contest. Cook’s second great assist provided Richard Hendrix with an easy dunk inside for his first points. The tide swung in Armani’s favor when Oleson fouled out, following Nocioni out of the game and leaving Laboral without both of its most influential players in the game. 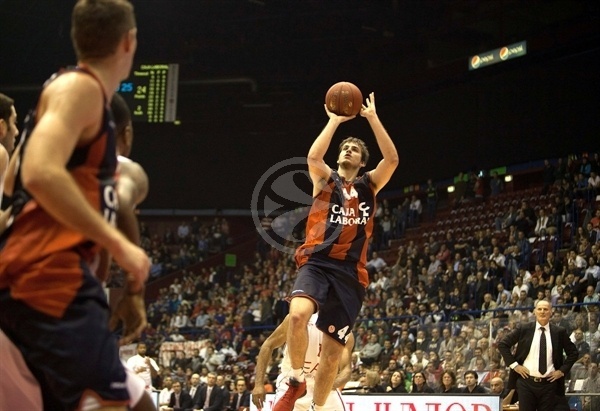 Beating the buzzer, Alessandro Gentile gave Armani an all-important lead, 66-65, to go into the final quarter ahead. The lead changed hands again at the start of the fourth, courtesy of Carlos Cabezas’s points from the free throw line. A Fotsis deep three once again had the home side in front, then Bjelica mirrored that as the scene was set for a quarter of big shots. Finally a side pulled ahead, and it was Caja Laboral when Bjelica nailed another three and San Emeterio sank a two to put the score at 71-77. Bjelica’s dunk showed that he has inside game as well, Cabezas put in another two and suddenly Laboral had made it a 10-point game. Bjelica kept on answering the Armani offense as Laboral broke away, and the lead was still 7 points going into the final 30 seconds. Fouls conceded late kept sending the away side to the line, it hit its free throws and the game ended 85-95, giving a first win of 2012-13 to Caja Laboral. "My teams have been always been good competitors and defenders. We showed tonight we have to improve a lot on our defensive attitude. We have to be ready to compete for all 40 minutes. After the technical foul on Fotsis, our concentration decreased and the momentum changed. Congratulations to them for their win." "'I'm very happy and proud of my team win; we played a good game. 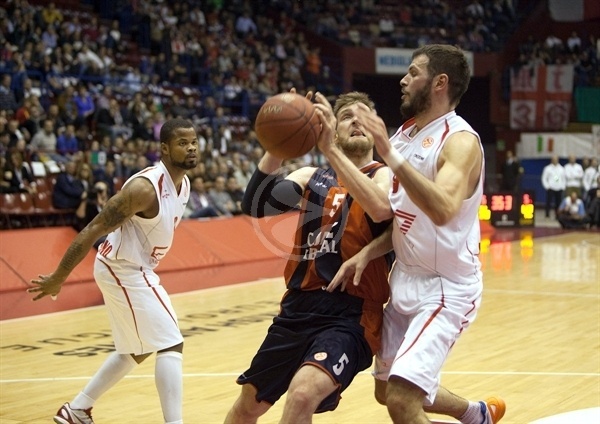 It was very important to win after last week's defeat against Zalgiris at home. We know them very well after playing twice in the pre-season and I think our tough defense was in the end the key to winning." "It was a great mistake to lose concentration in the last quarter; we forgot to box out and left them too many rebounds and also open three-pointers. Now we have to go to Kaunas, which is coming off two great performances and it won't be easy. To advance to the Top 16 in this group, we cannot lose another home game." "We knew it would be a very difficult game, but also we knew it was very important for us to be back in the run for the Top 16. This now put us back on track, and I'm very happy for the team performance and also for my game. We showed character in the most difficult game so far."